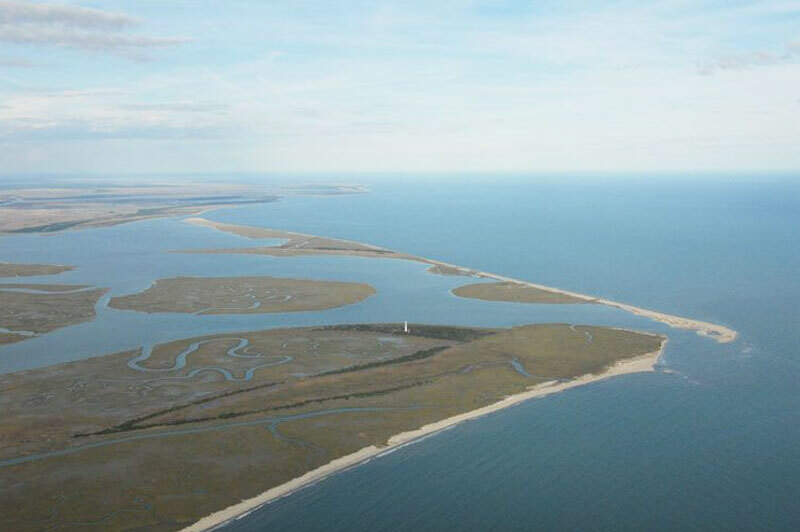 Cape Romain is South Carolina’s only cape and its most erosional coast. 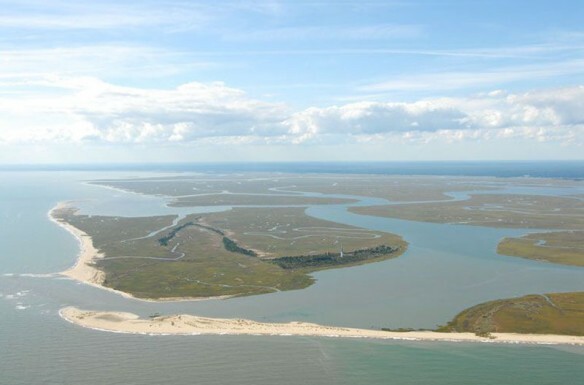 (1) Here is a vast estuary, with beaches miles offshore, only accessible by boat. Behind the beach is a labyrinth of islands and creeks, mostly low lying and muddy, though some have trees and abundant foliage. Change is happening rapidly here. Shores and entrances to inlets at the edge of the open ocean are receeding. Some land has completely disappeared. The fishing chart sold at the general store looks to be over 30 years outdated. Called a cuspate foreland, the triangular formation extends 8 miles off the coast at its point. (2) Shoals extend miles offshore and keep the beaches alive, feeding them with sand. 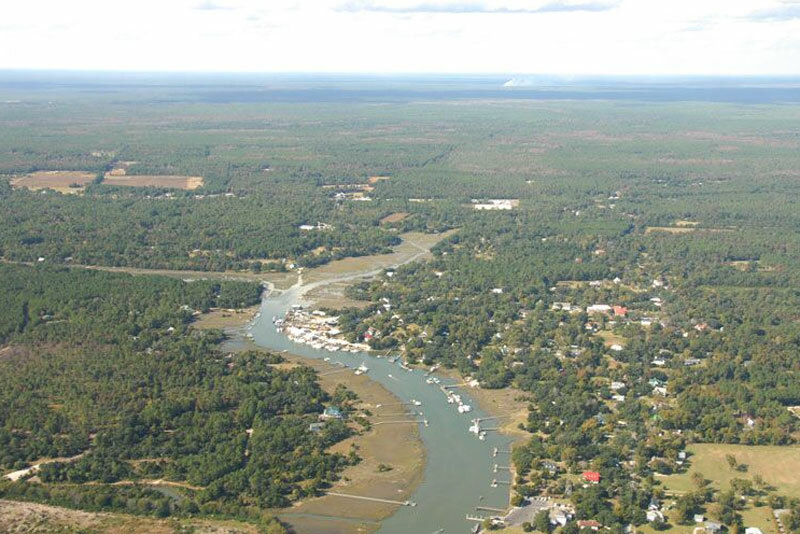 Last year, I lived in the town of McClellanville, landward of the Cape Romain National Wildlife Refuge. Of greatest interest to me there is Cape Island, an (approximately) north-south oriented barrier island, with sand spits growing on both ends. 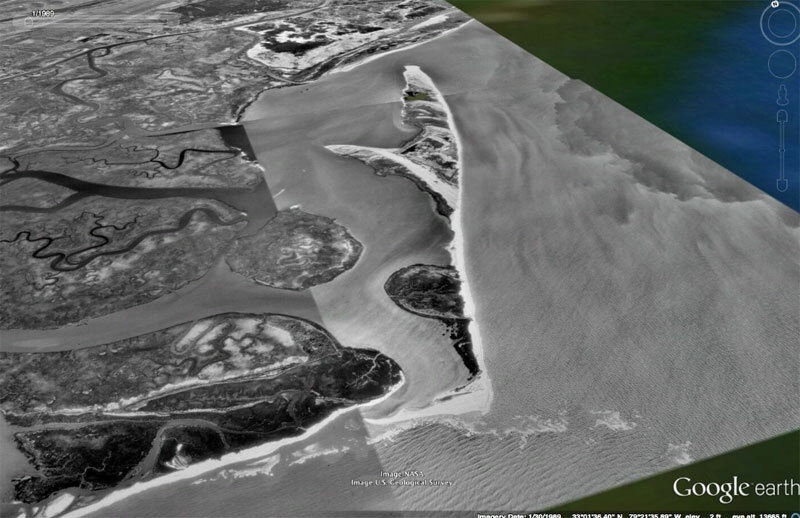 The north-pointing spit is the largest recurved spit in South Carolina and is fairly stable, very different from the rapidly changing southern spit. Wind also accounts for the shape of Cape Island. 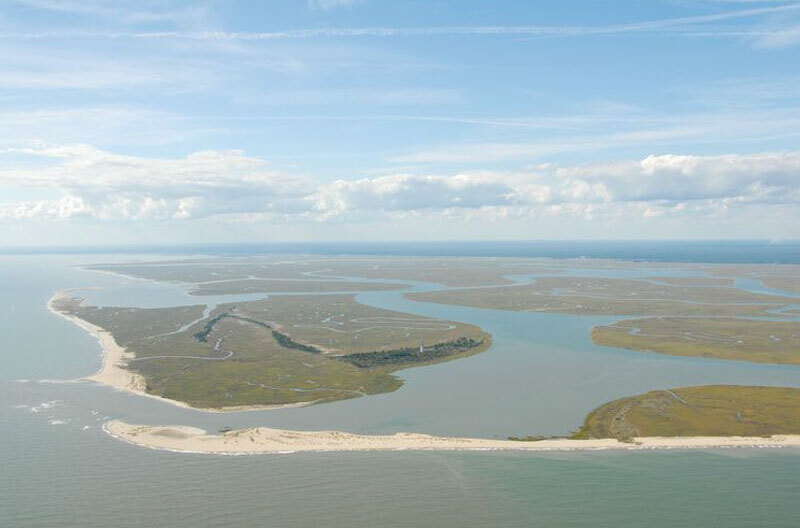 According to Hayes & Michel “cuspate forelands are most common on shorelines with two opposing wind directions” because the wind generates waves from opposing directions. (6) In the winter, storms come from the north and the southern spit will likely increase. Nor’easters can move slowly over the coast with sustained power. In the summer, the southern spit of Cape Island, and the southern flank of the cape face the wind. Hurricanes can bring dramatic instances of storm surge, wind and wave actions that carve these islands. 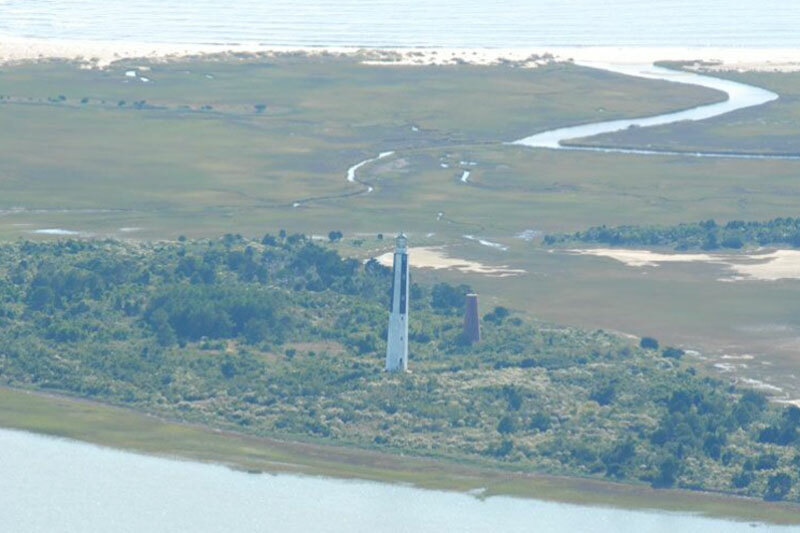 Lighthouse Island and Raccoon Key compose the southern flank of the cape. Toward the lighthouse, the dune fields are almost totally crushed, washover is perpetual, and new inlets often form where the beach in front of tiny creeks is eaten away. Major changes can be seen since the first 1989 satellite photograph was taken of this area. 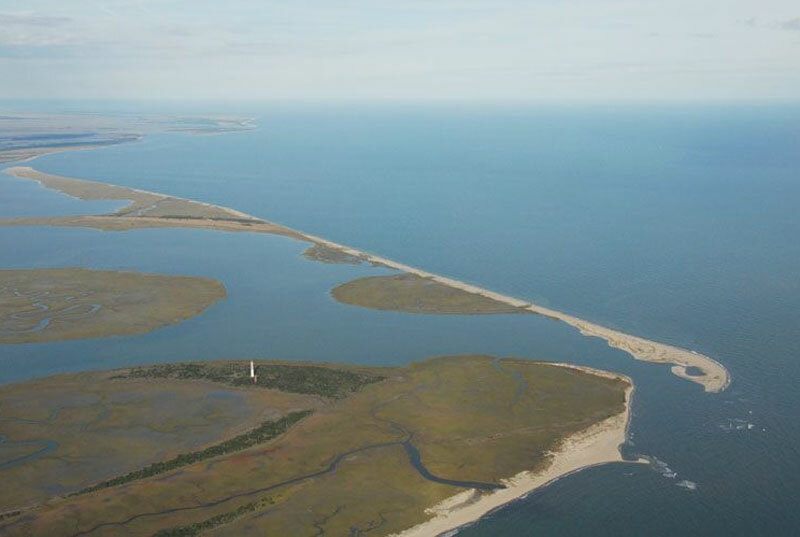 The southern spit shows its animation; accumulated sand grew over the inlet from 1989 to 1994, paralleling the beach at Lighthouse Island for the entire length of the island and blocking the inlet. By 2005, the elongated spit had broken off, opening the inlet again. 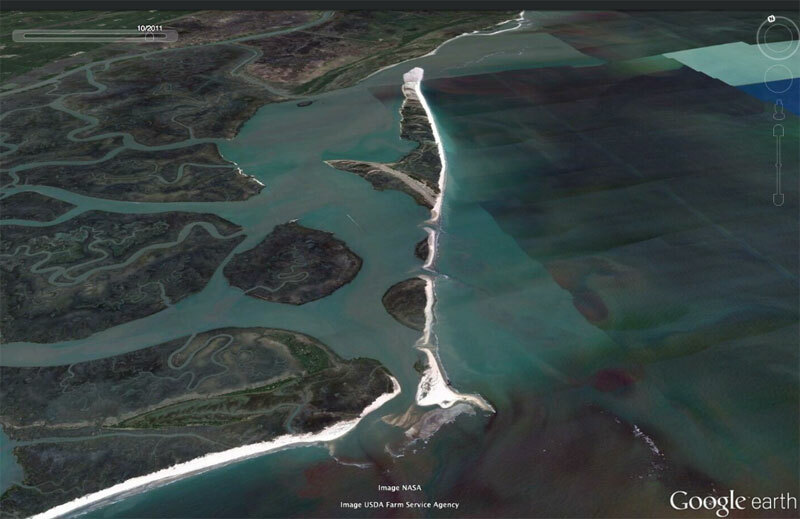 By 2013, it became clear that the southern spit was forming to cover this inlet again. Three breaches were made in Cape Island in 2011 with the hurricane event, Irene. 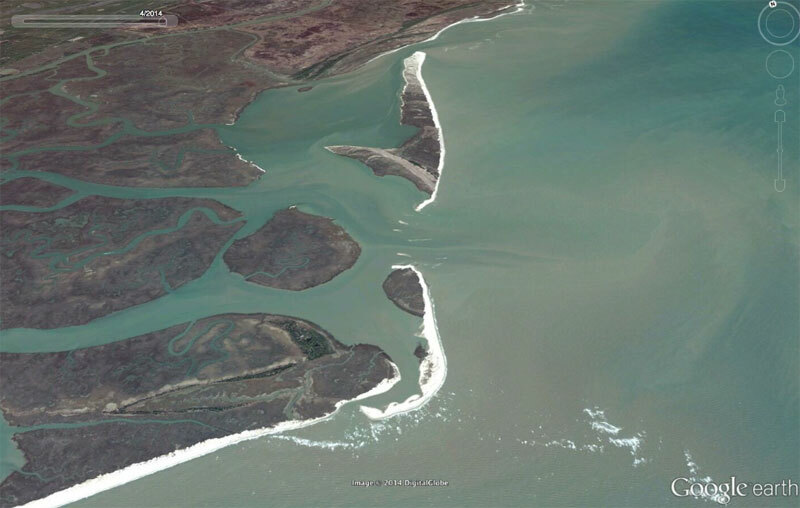 (7) One of the breaches healed itself quickly, while the other two and the land between completely washed out to create a new inlet dividing Cape Island in half. Despite the rapid erosion at the new inlet on Cape Island, the relatively stable north end supports a diversity of plants and the southern end has active dunes and a highly dynamic accreting sand spit. 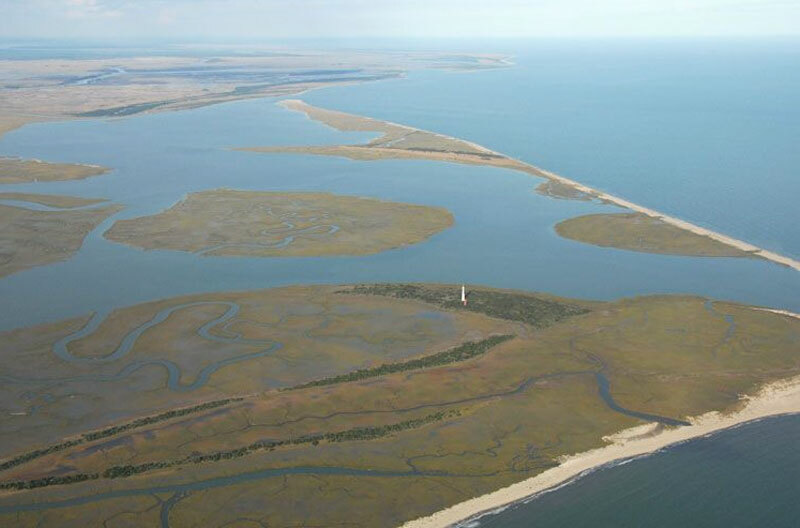 Cape Romain’s marsh islands are largely silt and clay. Once suspended in water, these fine particles are moved more easily than coarse sand. (11) This is one clue to decoding the complex morphology of this area. On a mesotidal coast (as found in South Carolina), the ebb-tidal (outflowing) delta is much larger than the flood-tidal (incoming) delta deposits, another clue which accounts for the seaward shoals found at inlets. 12 miles off the coast of the active Santee delta front line “a complex of reworked deltaic deposits” which give a ghostly, perplexing impression of where islands might have been long ago. From the aerial images, you can trace the lines of change on some landforms. 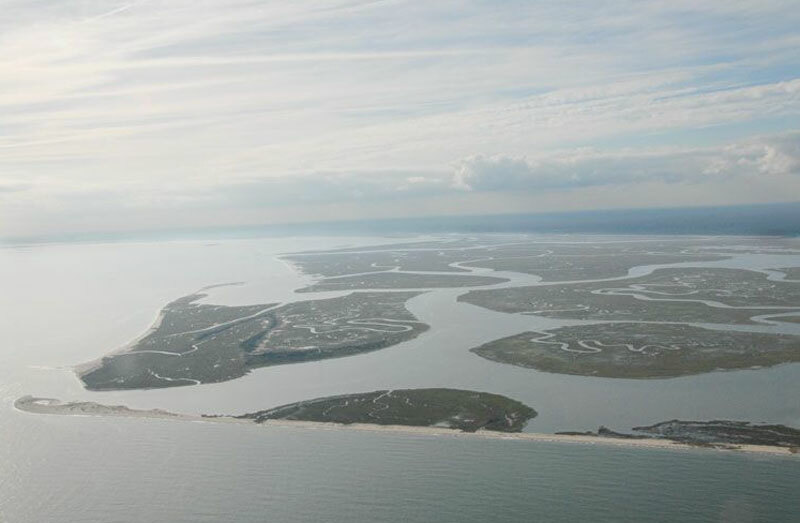 (14) Landward of the Santee are “multiple, parallel highstand beach ridges” which are bands adjacent to the delta from the late Pleistocene (2.6 million to 11,700 years ago). The Santee dissected these ridges during the “Late Wisconsin sea level lowstand” (about 18,000 years ago). 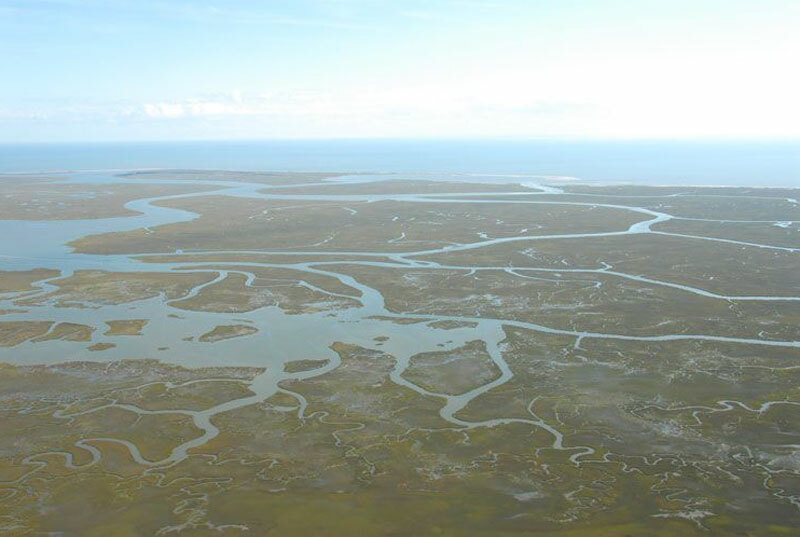 At the time of the early Holocene when sea level rise began to slow to a steady rate (about 6,000 years ago), barrier islands formed in equilibrium with the forces of change, and the Santee delta likely began to resemble what we see today. The northern spit of Cape Island shows rings of growth northward of at least several hundred years. (15) In this flooded landscape, low-lying evidence is rewritten and rearranged. Dams upstream remove sediment from the waters of Santee now, but allow water flow, contributing to erosion here and down the shore. (16) This area will remain the most erosional in South Carolina, revealing the reality of sea level rise from the minuscule to the aerial view. 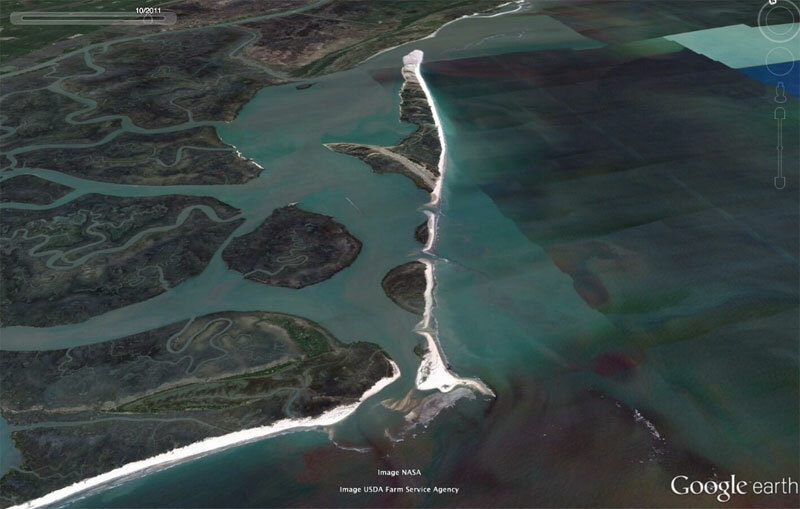 Cape Romain’s beaches and islands are spectacular locations to see the forces of coastal change at work. (1) “A study by one group published in 1975 showed that, except for the outbuilding recurved spits at each end of the Cape, the shoreline retreated about 20 ft per year between 1941-1973. Based on later observations, this rate of retreat has increased.” A Coast for All Seasons, Hayes and Michel. (2) Cuspate forelands are “triangular-shaped features composed of sand and/or gravel that project either perpendicular or at a small angle to the overall trend of the shoreline.” A Coast for All Seasons, Hayes and Michel, pg. 170-174. 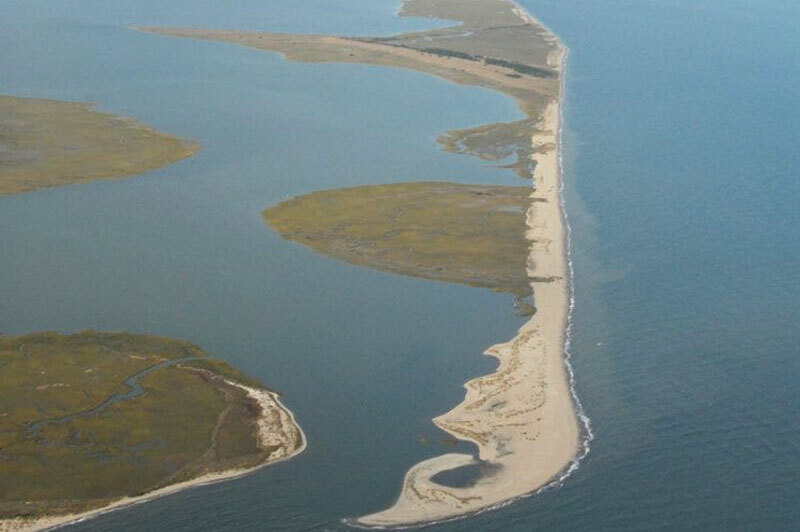 (3) “Cape Island, which makes up the northernmost flank of the Cape, is composed of half recurved spit and half transgressive barrier island. 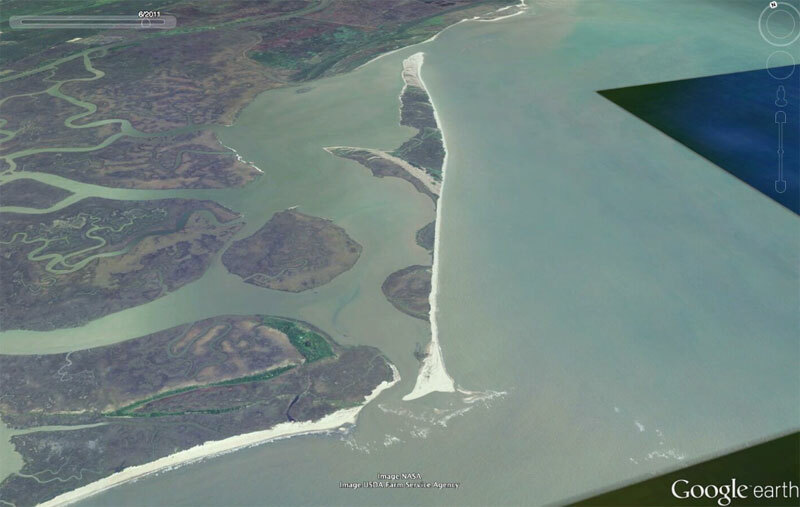 The spit projects in a northerly direction, presumably as a result of refraction of waves around the shoals offshore of the Cape.” At entrance to Santee rivers, there are recurved spits on the northern side. “These entrances are major mesotidal inlets with associated recurved spits on their northern (updraft) sides and large ebb-tidal deltas.” The Geologic Impact of Hurricane Hugo and Post-Storm Shoreline Recovery Along the Undeveloped Coastline of South Carolina, Dewees Island to the Santee Delta, Sexton & Hayes, Journal of Coastal Research, Spring 1991. 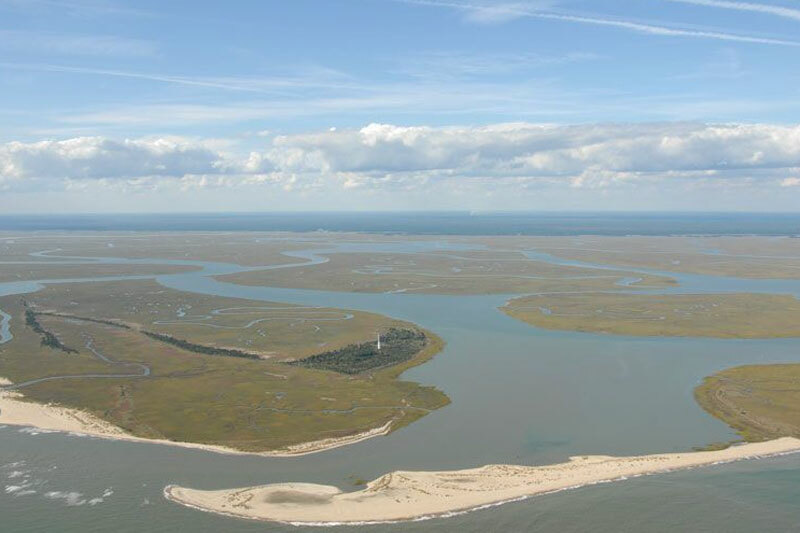 (4) Beach Erosion in South Carolina, Hayes, Moslow, and Hubbard, Coastal Zone Information Center. (5) A Coast for All Seasons, Hayes and Michel, pg. 155. (6) Cape Romain is unlike the other capes in North Carolina which are eroding on the north sides with spits that grow to the south. 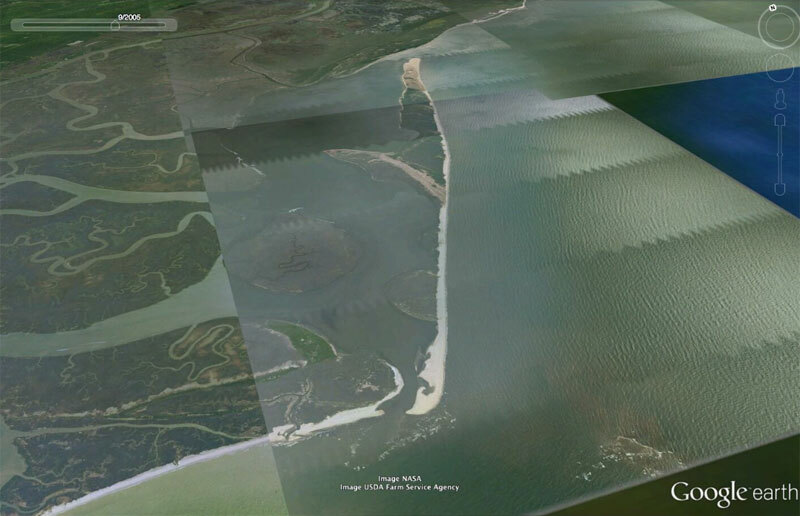 Cape Romain is relatively symmetrical, perhaps because it has been shielded by the large Santee River Delta and as it has eroded, moving landward. A Coast for All Seasons, Hayes and Michel, pg. 170-174. 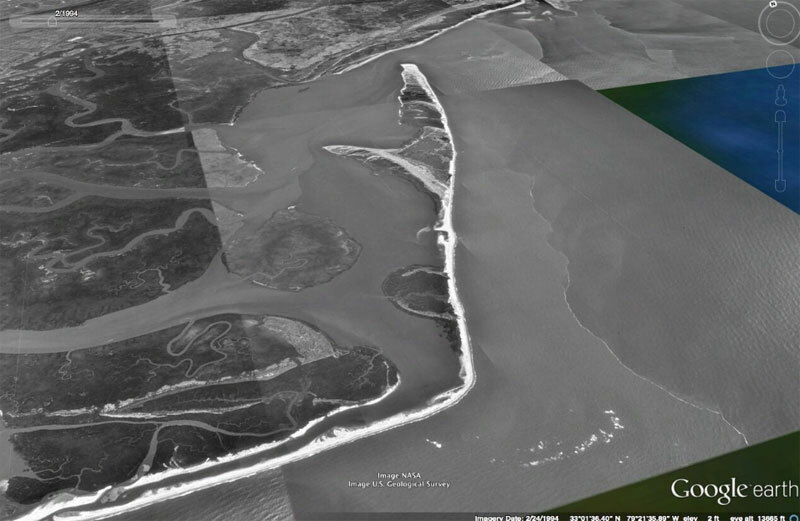 (7) Cape Romain Aerial: Post Irene (video), DNR. (9) Tracing the Cape Romain Archipelago, Bob Raynor, pg. 45-47. (10) Some links to early maps that include Cape Romain (also spelled Cape Roman and called Cape Carteret): 1671; 1764; 1775; 1791; 1909. (11) Atlantic Coast Beaches: A Guide to Ripples, Dunes and other Natural Features, Neal, Pilkey, and Kelley, pg.73. (12) A Coast for All Seasons, Hayes and Michel, pg. 154. (13) A Coast for All Seasons, Hayes and Michel, pg. 174-175. (14) Aerial photographs were taken by Mary Edna Fraser in 2006. Her aerials show the terrain’s geography and also the shape of dunes and other details revealed in the oblique view. (15) A Coast for All Seasons, Hayes and Michel, pg. 174. (16) The “accelerated rate of erosion on the Cape in recent years is probably due, at least in part, to the diminished sand supply to the Santee River delta as a result of the building of the dam on the Santee River in 1942.…15 miles to the north of the arrowhead point of the cape.” A Coast for All Seasons, Hayes and Michel, p. 174.